HIDDEN ART has collapsed. The pioneering organisation that helped 6,000 artists and designers over 22 years has run out of financial support. Director Dieneke Ferguson tried to find new sources of funding after the end of grants from the European Regional Development Fund (ERDF – £600,000 over three years – and the London Development Agency, but could not. She says: “Over the last years with no funding to match the ERDF money, Manuel Ruiz-Adame, the finance director, and I have been contributing the missing funding personally.” He and the Utrecht University-Birkbeck College-educated Ferguson were HA’s last two employees. 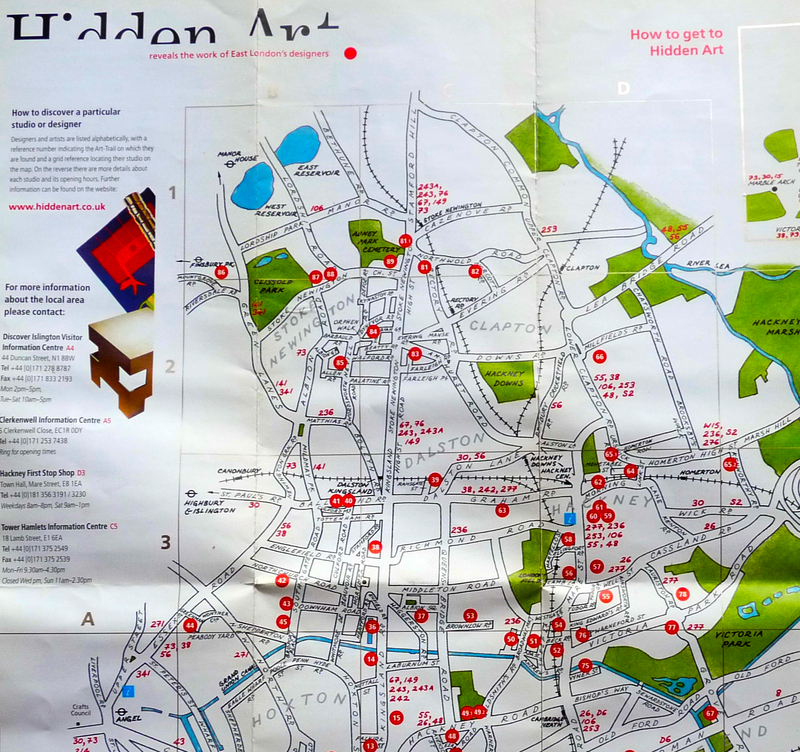 Hidden Art, a not-for-profit organisation, which sprang from a proposal by your reporter to a council-City business agency in the late 1980s, started by seeking funds, then channelling them to artists and designers in Hackney, before concentrating on design. It ran visit-studio weekends, which became hugely popular with art and craft lovers from all over England. In the early days a free bus would cruise Hackney bus stops to take people to the studios, scattered around East London. They could hop on and off at whichever studio’s work appealed to them from the list on HA’s superb free pocket maps. Ferguson recalls having to amend the route because users were afraid to venture into the grimmer ends of the East. At the time Hoxton and Shoreditch, in particular, were widely seen as infestations of thieves, whores and gangsters. HA also hired a stand every year at 100% Design in West London and at the Milan Furniture Fair to show the work of designers, and HA’s annual awards scheme gave financial aid to almost 100 designers. Eventually, it collaborated with University College Falmouth to help craftspeople in Cornwall. The Hidden Art Select range includes Hidden Art Select Kids, a commercially viable collaboration between a designer and schoolchildren. Ferguson is a heroine of the East End renaissance. When she set up Hidden Art, “hipster” was a word not heard in Kingsland Road, where she set up her office, but she had faith in the area’s potential. * Further info: Dieneke@hiddenart.co.uk. Or try phoning 020 7729 3800.